My Grandparents owned and lived on a blueberry farm in the mountains of North Carolina. They called their blueberries their "blueberry patch", though it was actually a couple of acres of their large property. The blueberries were part retirement hobby, part huge fun, and part lots of work for my Grandfather, but he loved it! And so did we. When we would visit in the summertime we'd spend our days swimming in their pond and then running over to the "blueberry patch" to stuff our mouths with blueberries fresh off the bush. A few days a week all season they would open it up to other people who would pay to come and pick their own blueberries on the farm. 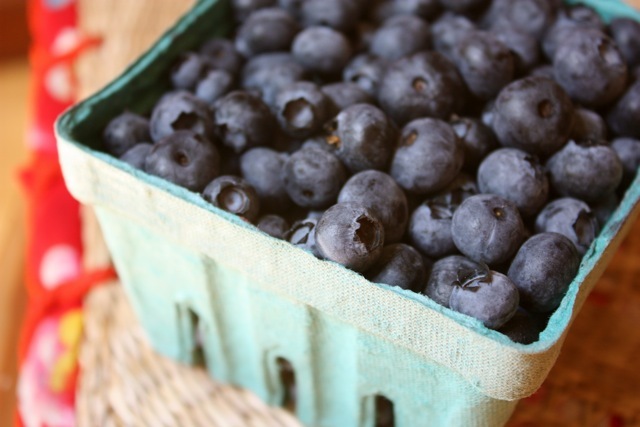 I still always look forward to blueberry season, they are still one of my favorite fruits. The kids and I can sit down and eat a whole pint fresh from the farmer's market in one sitting! And of course I can't eat them without thinking of my Grandparents and all of our sweet times. They are gone, but my aunt still runs the farm and the blueberry patch. She emailed me the other day to let me know that the picking season is in full swing right now and that hopefully there will still be some fruit left on the bushes when we visit the farm in August. They look so good! Another reason I love summer - it's like the other seasons just don't stand a chance against summer. Yum, the blueberry patch sounds amazing. I saw a sign at the farmer's market here in CA saying that they are over (blueberries) so I hope you can make it to the farm soon. So sweet Faith. That is a gorgeous picture of blueberries! yum... it is the simple things... no? so sweet.